Growing up as Chinese in South Africa, and later moving to Amsterdam, made for plenty of inspiration for me as a tattoo artist. Coming from a conservative family, in my teen years, I decided to stray from the mentality of those in my family. My liberal and freethinking ways lead to my interest in body art. Being self-taught, my techniques and style are sometimes unconventional. All of my work is unprepared and literally "Freestyled" on the client on the day of tattooing. The spontaneity of my tattoos are part of what makes them so unique. Neither I nor the client really know what's going to happen. With plenty of tough life lessons coupled with worldly travels and influences from artists abroad, my style continues to grow and evolve. Always eager to learn something new, I emerged as a well rounded tattooer. My specialty is large scale surreal/abstract tattoo’s that make use of the body's natural curves and shapes as part of the design. Contradictory to my personality, which is very quiet and shy, my tattoos are bold, bright and in your face. Never settling for anything but the best, I continue to develop and collaborate with other world renown artists to further hone my skills. My art derives from the combination of so many styles and techniques, I need a machine which is diverse enough to help me accomplish any technique, accurately and efficiently. From fine detailed lines, to thick bold outlines, solid color packing to soft shading, dot work to brush strokes, Cheyenne does it all. 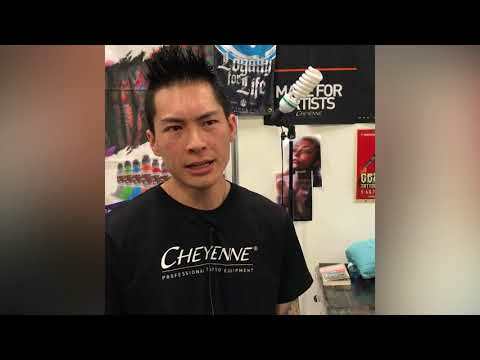 I’ve stated before that to me Cheyenne is the Apple of the tattoo industry, they are the market leaders in innovative technology. Being an innovative artist myself I need to work with a company that can create the tools needed to push the boundaries of tattooing. The machines I use are the HAWK Thunder and HAWK 10-year Edition to be able to achieve a full range of the techniques I use. I do really large-scale pieces and these machines allow me to work efficiently by putting the ink in, in a single pass without trauma to the skin. I use the HAWK Thunder for all my lining and solid color packing because of its power. The HAWK 10-year Edition is much softer, so I use it for shading and color blending.